Received February 18, 2019; Revised February 25, 2019; Accepted February 27, 2019. Light-emitting diodes curing unit (LCU), which emit blue light, is used for polymerization of composite resins in many dentistry. Although the use of LCU for light-cured composite resin polymerization is considered safe, it is still controversial whether it can directly or indirectly have harmful biological influences on oral tissues. The aim of this study was to elucidate the biological effects of LCU in wavelengths ranging from 440 to 490 nm, on the cell viability and secretion of inflammatory cytokines in MDPC-23 odontoblastic cells and inflammatory-induced MDPC-23 cells by lipopolysaccharide (LPS). The MTT assay and observation using microscope were performed on MDPC-23 cells to investigate the cell viability and cytotoxic effects on LCU irradiation. MDPC-23 cells and LPS stimulated MDPC-23 cells were found to have no effects on cell viability and cell morphology in the LCU irradiation. Nitric oxide (NO) and prostaglandin E2 which are the pro-inflammatory mediators, and interleukin-1β and tumor necrosis factor-α (TNF-α) which are the proinflammatory cytokines were significantly increased in MCPD-23 cells after LCU irradiation as time increased in comparison with the control. LCU irradiation has the potential to induce inflammation or biological damages in normal dental tissues, including MDPC-23 cells. Therefore, it is necessary to limit the use of LCU except for the appropriate dose and irradiation time. In addition, LCU irradiation of inflammatory-induced MDPC-23 cells by LPS was reduced the secretion of NO compared to the LPS alone treatment group and was significantly reduced the secretion of TNF-α in all the time groups. Therefore, LCU application in LPS stimulated MDPC-23 odontoblastic cells has a photodynamic therapy like effect as well as inflammation relief. The tooth-colored composite resin used for restoration has been widely used since its introduction in the dental field in the 1970s due to the increasing problems of dental amalgam and demand for esthetic restoration of patients1). In addition, the use of tooth-colored composite resin in posterior restorations as well as anterior restorations has increased and it is also used for the bonding of stainless- steel brackets and ceramic brackets in orthodontic treatment2,3). In aesthetic dental restorations, the tooth- colored composite resin is polymerized by the energy of the laser produced by light curing units4). Activated tooth- colored composite resins that do not receive sufficient energy by the light curing units break down along the restored margins, weaken the bond strength with the tooth, and lack hardness5). Therefore, the light curing units have been developed with the rapid increase of the aesthetic dental restorative technique using the light-cured composite resins6). There are three types of light curing units that are mainly used in dentistry for light-cured composite resins polymerization, and these three types of LCU have different light sources, namely, halogen curing units (HCU), light-emitting-diode curing units (LCU) and plasma arc curing units (PCU)4). HCU has disadvantages in that only a small amount of the total energy is used for the polymerization of the light-cured composite resins and most of the energy generates heat, resulting in poor energy efficiency and long timings for polymerization4). LCU and PCU have been developed to complement the shortcomings of HCU and to reduce the clinical chair time used for light curing time5,6). PCU has a very high energy intensity of more than 2,000 mW/cm2, which enables polymerization of the light-cured composite resins in a short time, but the rigidity of the composite resin during polymerization is significantly low, shrinkage is large, and it is very expensive7). Light-emitting diodes (LEDs), introduced in 1990s, consist of a combination of two semiconductors and are an effective method of converting electrical energy into light or laser6). The LCU, that uses LEDs as light source, generates up to 1,100 mW/cm2 energy at a wavelength of 402∼600 nm and has a semi-permanent, low price, and provide a strong vibration and shock resistance6). Therefore, LCU, which is seen as blue light, is used for polymerization of composite resins in many dentistry8). Although the use of light curing unit for polymerization of composite resin is considered safe, its safety is controversial whether it can directly or indirectly have harmful biological influences on oral tissues, including dental and non-dental tissues9,10). Studies on the biological effects of light irradiation of LCUs using oral cell-derived cell lines are not sufficient6). MDPC-23 cells are odontoblastic cells derived from dental papilla of fetal mouse molars. Odontoblast is a representative dental tissue cell that produces most of the extracellular matrix of dentin and is involved in mineralization of dentin11). Odontoblast is directly influenced by LCU irradiation during resin polymerization in dental treatment when exposed to dental pulp and deep cavities4). We applied a LCU of blue light with distinct wavelengths ranging from 440 to 490 nm, which is widely used for polymerization of light-cured composite resins in dental clinics, for the most commonly used 20 seconds in other to evaluate biological effects on the cell viability and secretion of inflammatory cytokines in MDPC-23 odontoblastic cells and inflammatory-induced MDPC-23 cells by lipopolysaccharide (LPS). MDPC-23 cells were obtained from Dr. CT Hanks of University of Michigan (Ann Arbor, MI, USA). Cells were cultured in Dulbecco’s modified Eagle’s medium (DMEM; Gibco-BRL, New York, NY, USA) supplemented with a 1% antibiotic-antimycotic solution (Gibco-BRL) and 10% fetal bovine serum (Gibco-BRL). Cells were maintained in a humidified CO2 incubator at 37°C. LCU is a Dmetec Skylight product (Dmetec, Bucheon, Korea) with a wavelength of 440∼490 nm, which is widely used in dental clinics (Table 1). Cells were irradiated with LCU under the same conditions as when polymerizing a resin using LCU in dental clinic and the LCU held 2 cm away from the cells during exposure. The cells were divided into four groups as follows: the control, LPS alone treatment (100 ng/ml), LCU alone irradiation, and co- treatment group of LPS and LCU. The cell viability and cytotoxic effects were assessed using a 3-(4,5-dimethylthiazol-2-yl)-2,5-diphenyltetrazolium bromide (MTT) assay. The MDPC-23 cells were seeded in 48-well plates and treated with 100 ng/ml LPS, irradiated with LCU for 20 seconds, or co-treated with LPS and LCU and then incubated for 0, 24, and 48 hours. The culture medium was removed from the cells that were then washed three times with PBS and then fixed using a solution containing 3.7% formaldehyde (Sigma Chemical, St. Louis, MO, USA). The images of cells were obtained using an inverted phase contrast microscope (Carl Zeiss, Oberkochen, Germany). Nitric oxide (NO) production was measured in cell supernatants of LPS alone treated, LCU alone irradiated, and LPS and LCU co-treated cell using the NO assay kit (R&D systems, Minneapolis, MN, USA). A 2-fold diluted culture supernatant was transferred to 96-well plate, and an equal amount of Griess reagent was added. The plate was then incubated for 10 minutes, and the absorbance was measured at 540 nm on a microplate reader (BioTek Instruments, Winooski, VT, USA). The amount of NO was calculated using sodium nitrite standard curve. The concentration of prostaglandin E2 (PGE2) was measured in cell supernatants using the PGE2 enzyme-linked immunosorbent assay (ELISA) kit (R&D systems). The absorbance was recorded at 490 nm using a microplate reader (BioTek Instruments). The PGE2 concentration in cell supernatants was determined using a PGE2 standard curve. MDPC-23 cells were lysed using an NP-40 containing lysis buffer (150 mM NaCl, 1% NP-40, 50 mM Tris-HCl [pH 7.4], 2 mM Na3VO4, 2 mM Na4P2O7, 50 mM NaF, 2 mM EDTA [pH 7.4], 0.1 μg/ml leupeptin, and 1 μg/ml aprotinin). Following, the total protein concentration of the samples was estimated using protein estimation kit (Bio-Rad, Hercules, CA, USA) and 30 μg of the protein samples was subjected electrophoresis in 10% SDS- polyacrylamide gel. After electrophoresis, the protein was transferred to a polyvinylidene difluoride (PVDF) membrane (Merck Millipore, Darmstadt, Germany). The membrane was blocked with 5% bovine serum albumin (Bioshop, Burlington, Canada) for 1 hour. The membranes were blotted with 1:1,000 anti-rabbit interleukin-1β (IL-1β) and tumor necrosis factor-α (TNF-α) antibodies (Abcam, Cambridge, United Kingdom), and 1:2,500 anti-mouse β-actin antibody (Santa Cruz Biotechnology, Dallas, TX, USA) for 16 hours at 4°C. After washing, the membrane was probed with 1:5,000 HRP-conjugated goat anti-rabbit or goat anti-mouse secondary antibody (Santa Cruz Biotechnology) for 1 hour. The signals were developed on X-ray film (Fuji Film, Tokyo, Japan) after detection using an ECL solution (Merck Millipore). The intensities of bands corresponding to respective proteins were measured using Science Lab Image Gauge (Fuji Film). All experiments were carried out in triplicate. All the data is reported as the mean and standard deviation determined using Microsoft Excel 2010 software (Microsoft, Redmond, WA, USA). The significant differences (p<0.05, p<0.01) were determined using a Student’s t-test. The cells were irradiated for 20 seconds using LCU within 440 to 490 nm wavelength range, which is widely used for composite resin polymerization in actual clinical practice. Cells were also induced inflammation with 100 ng/ml of LPS, and each treatment group was incubated for 0, 24, and 48 hours. The MTT assay was performed to investigate the cell viability and cytotoxicity of LCU irradiation on MDPC-23 cells. MDPC-23 cells were found to have no significant effects on the cytotoxicity and cell viability in all the three group, i.e., LCU alone irradiation, LPS alone treatment and the co-treatment group of LCU and LPS (Fig. 1A). The morphological changes were observed under microscope, and the elongation of the protrusions was seen in the LPS alone treated and in the co-treatment group of LPS and LCU, however, no morphological change was observed in the LCU irradiation alone group (Fig. 1B). Effects of light-emitting diodes curing unit (LCU) irradiation on cell viability and morphology of MDPC-23 cells and lipopolysaccharide (LPS) stimulated MDPC-23 cells. The cells were irradiated for 20 seconds using LCU with wavelengths of 440 to 490 nm and LPS was treated with 100 ng/ml. (A) The cell viability on LCU irradiation was assessed with MTT assay. The results obtained from three independent experiments were expressed as a ratio of values in the surviving cell to the values in the control group (no treatment group of LPS and LCU), and the values were expressed as mean±standard deviation. (B) Morphological changes of MDPC-23 cells by the LPS alone treatment, the LCU alone irradiation and co-treatment group of LPS and LCU were observed by inverted phase contrast microscope. Scale bars=60 μm. The production of NO by MDPC-23 cells was significantly increased in comparison to the control, depending on LPS treatment, regardless of whether or not the LCU irradiation, but there was no change in LCU irradiation alone group (p<0.05; Fig. 2A). On the other hand, co-treatment group of LCU and LPS at 24 hours showed a decrease in the amount of NO compared to the 24 hours LPS alone treatment group but the differences were not found to be significant (Fig. 2A). The production of PGE2 in MDPC-23 cells was also significantly increased following LPS treatment, regardless of the presence or absence of LCU irradiation (p<0.05, p< 0.01) and the LCU irradiation alone group showed a slight increase in PGE2 production with time but there was no significant difference. However, significant increase in PGE2 production could be confirmed for LCU alone irradiation group only after 24 hours (p<0.05, p<0.001; Fig. 2B). These results indicate that MDPC-23 cells are affected by LCU irradiation alone and increase the production of NO and PGE2. On the other hand, in the case of MDPC-23 cells induced to inflammation by LPS treatment, the production of NO decreased by the LCU irradiation compared to the LPS alone treatment. Effects of light-emitting diodes curing unit (LCU) irradiation on nitric oxide and prostaglandin E2 (PGE2) production of MDPC-23 cells and lipopolysaccharide (LPS) stimulated MDPC-23 cells. MDPC-23 cells were irradiated for 20 seconds using LCU and LPS was treated with 100 ng/ml. The values of nitric oxide (A) and PGE2 (B) were measured in the supernatants of the culture medium using the Griess reaction and a commercial enzyme-linked immunosorbent assay kit. Values are represented the mean±standard deviation of results obtained in three independent experiments. *p<0.05 and **p<0.01 compared with the control group. IL-1β and TNF-α which are pro-inflammatory cytokines, were investigated in order to elucidate the biological effects of LCU irradiation on MDPC-23 cells because LCU irradiation has different effects depending upon the type of pro-inflammatory mediators and cell lines. The amount of IL-1β by LCU alone irradiated the MDPC-23 cells was either greater or similar to that in case of LPS alone treatment. However, the amount of secretion of IL-1β was significantly increased with time in comparison to the control (p<0.01; Fig. 3A, 3B). However, the production of IL-1β in the co-treatment group of LPS and LCU at 60 minutes and 24 hours was slightly decreased compared to the levels in case of LPS treatment and LCU irradiation alone group, there was significant difference in that of 24 hours (p<0.01; Fig. 3A, 3B). 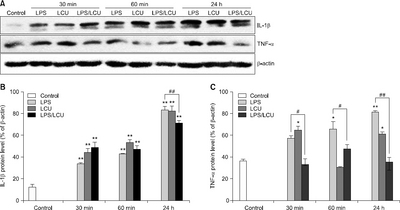 The amount of TNF-α secretion in LCU irradiated MDPC-23 cells was significantly increased at 30 minutes and 24 hours group compared to the control (Fig. 3A, 3C). In particular, the amount of TNF-α in LCU alone irradiated group at 30 minutes was higher than that in LPS alone treatment at 30 minutes (Fig. 3C). In addition, the amount of TNF-α secretion in the co-treatment group of LPS and LCU of MDPC-23 cells was significantly reduced compared to the LPS alone treated group in the corresponding time period (Fig. 3C). In other words, MDPC-23 cells increase the secretion of TNF-α in LCU irradiation. These results indicate that MDPC-23 cells show inflammatory response to LCU irradiation. In addition, LCU irradiation of LPS treated MDPC-23 cells resulted in a significant reduction in the secretion of TNF-α in all time groups. These results indicate that LCU irradiation in inflammatory conditions is effective in relief of inflammation. Total protein expression of interleukin-1β (IL-1β) and tumor necrosis factor-α (TNF-α) by the light-emitting diodes curing unit (LCU) irradiation in MDPC-23 cells and lipopolysaccharide (LPS) stimulated MDPC-23 cells. The cells were irradiated with LCU for 20 seconds and LPS (100 ng/ml) was treated. (A) Total protein was extracted from the MDPC-23 cells and was subjected to western blot analysis using indicated antibodies. Actin was used as internal control for the western blot assays. The values of IL-1β (B) and TNF-α (C) in the culture supernatants were measured by commercial enzyme-linked immunosorbent assay kits. Value are represented the mean±standard deviation of results from three independent experiments. *p<0.05 and **p<0.01 compared with the control group. #p<0.05 and ##p<0.01 compared with the LPS groups. MTT assay is widely used as an indirect but accurate and useful method to confirm the effect of DNA synthesis on cytotoxicity, cell viability and morphology12). There are many previous reports of MTT assays that have been shown to influence the proliferation of various cell lines following light irradiation of various sources6,12). The results have shown that the possibility of cell proliferation is gradually decreasing, which is due to inhibition of mitosis12), inhibition of mitochondrial activity13), and oxidative stress13) resulting from DNA damage12) and the production of reactive oxygen species (ROS)12). In this study, LCU irradiation for 20 seconds was used to treat MDPC-23 odontoblastic cell line derived from dental papilla, which is a widely used method for tooth-colored composite resin polymerization in dental clinics. As a result, the cell viability and morphology of MDPC-23 cells were not affected by LCU irradiation. These results are attributed to differences in the types of cells and light doses than previously reported. Previous studies have often been unclear in terms of the intensity and duration of light, and the conditions reported were also different from the way this technique is applied to dental treatment4,14). In this study, the conditions of LCU light irradiation were set and applied in accordance with the method commonly followed in dental clinical practice. The amount of irradiation dose of LCU in this study is very small compared to that reported previously. Thus, the present irradiation dose of LCU was found to have no effect on the cell viability and morphology of MDPC-23 cells, indicating the absence of any risks of LCU irradiation. However, increasing irradiation doses and times may have the potential to affect the cell viability and morphology of MDPC-23 cells. This possibility is confirmed by the significant increase in the secretion of NO and PGE2 which are the pro-inflammatory mediators, and IL-1β and TNF-α which are the proinflammatory cytokines after 24 hours of LCU irradiation in normal MDPC-23 cells. NO is an easily diffusible and water-soluble gas and free radical. High levels of secreted NO activate surrounding host cells and cause tissue damage15). PGE2 is also involved in pain and heat generation in inflammatory and immune responses15). NO and PGE2 are pro-inflammatory mediators that play an important role early in the inflammatory response and are secreted by the stimulation of inflammatory factors such as LPS, TNF-α, and interferon-γ16,17). IL-1β, which is produced by macrophages or immune-related cells during inflammation, and TNF-α, which mediates the inflammatory response, are proinflammatory cytokines that are mainly used as indicators of inflammatory states of the cell since their secretion is increased during inflammation18). The expression of proinflammatory genes such as those encoding NO, PGE2, IL-1β, and TNF-α is increased by LPS stimulation because of the transcriptional factor nuclear factor kappa B (NF-κB), that remains complexed in the cytoplasm with inhibitory kappa B (IκB)18-20). IκB degradation occurs following stimulation with LPS, and the released NF-κB enters the nucleus and acts as a transcription factor resulting in increased expression of proinflammatory genes18,21). These results are also related to the outcome of a continuous process of heat generation and reaction through the photoreceptor22,23). The production of heat has a negative effect on living cells, tissues and their regeneration process24,25), light absorption through flavins and cytochromes induces production of ROS in the cell, disturbing the function of DNA26), mitosis of cells27), and mitochondria10). In particular, flavins and cytochromes that respond to blue light generated by LCU are the photoreceptors linked to the mitochondrial respiratory chain28,29). Absorbed blue light from LCU induces oxidative stress12) and secretion of inflammatory cytokines through the activity of transcription factors such as NF-κB30). This is the first report revealing the inflammatory effect of LCU irradiation on the MDPC-23 odontoblastic cells. LCU irradiation has the potential to induce inflammation or biological damages in the normal dental tissues, including MDPC-23 cells. Therefore, it is necessary to limit the use of LCU except at the appropriate dose and for a irradiation time. The report of on the non-invasive photodynamic therapy (PDT) shows that irradiation with low-energy light source has a dramatic effect on inflammation relief and wound healing, and is available for treatment23). Although the advent PDT was for the treatment of cancer, PDT has also found applications in wound healing22,23), venous leg ulcers31), pain relief32), rheumatoid arthritis33), skin diseases, skin cancer14) and periodontal diseases23). In particular, low-level light energy lasers in PDT have been reported to inhibit inflammation by inhibiting the expression of proinflammatory cytokines such as IL-1β and TNF-α besides increasing the secretion of anti-inflammatory cytokines such as SLPI18). In the dental field, low-level light energy lasers are used for periodontal disease, peri-implantitis, dental hypersensitivity, gingivitis, and intraoral ulceration. There are recent reports highlighting the use of PDT equipment using LEDs with low-level light energy commercially34,35). In this study, when LCU with low-level light energy was applied to inflammatory-induced MDPC-23 cells by LPS, interestingly, NO production was reduced compared to the LPS alone treatment group and TNF-α secretion were significantly decreased and as mentioned above the effect similar to that observed in PDT was achieved following LCU irradiation of LPS treated cells. It was interesting to have a PDT like effect when the irradiation dose and time of LCU used were those that are commonly used in the practice. Thus, LCU application on inflammation-induced MDPC-23 odontoblastic cells has a PDT like effect as well as inflammation relief. Wataha JC, Lockwood PE, Bouillaguet S, Noda M: In vitro biological response to core and flowable dental restorative materials. Dent Mater 19: 25-31, 2003. Yalcin M, Kenar H, Dayi B, Sisman R, Karaoz E: The effect of light curing units on proliferation and senescence of human dental pulp mesenchymal stem cells. Int J Dent Sci Res 4: 10-16, 2016. Aguiar FH, Braceiro A, Lima DA, Ambrosano GM, Lovadino JR: Effect of light curing modes and light curing time on the microhardness of a hybrid composite resin. J Contemp Dent Pract 8: 1-8, 2007. Goldberg M, Smith AJ: Cells and extracellular matrices of dentin and pulp:a biological basis for repair and tissue engineering. Crit Rev Oral Biol Med 15: 13-27, 2004. Sonis ST: The biologic role for nuclear factor-kappaB in disease and its potential involvement in mucosal injury associated with anti-neoplastic therapy. Crit Rev Oral Biol Med 13: 380-389, 2002. Simões A, Platero MD, Campos L, Aranha AC, Eduardo Cde P, Nicolau J: Laser as a therapy for dry mouth symptoms in a patient with Sjögren's syndrome:a case report. Spec Care Dentist 29: 134-137, 2009.